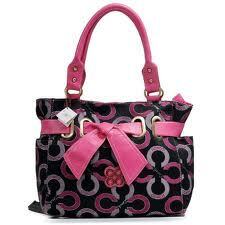 Diaper bags make the list on every baby registry. On mine it was so popular I got two of them, and while you may laugh, I am glad to say they are getting put to good use. Above everything else you may need for your new bundle of joy, a diaper bag is more of a necessity than I can even stress. To help, I have put together a list of some of my favorites so you can build your registry, or shop for your friends. Practicality meets high fashion. If I did not have kids, this would be my new purse. It has a bajillion pockets to hold all those itsy bitsy baby things, along with your make up, wallet, phone, and anything else you usually carry with you. This absolutely classic look channels Channel circ a 1966. Once the kids are all grown up, you still have an amazing Kate Spade purse. If your hubby has any reservations about using your Coach or Kate Spade diaper bag when he takes the baby out solo, he can opt to wear Oi Oi daddy gear. He can even take it to the office on Monday. I love their Baby Bag Patent Tote in berry, but it also comes in more neutral tones, and just like the others on this list, can double as a trendy purse. My favorite thing about it is its shear size; it has oodles of room. Amy Butler is known for her intricate designs and this bag is no different. The circular pattern is gorgeous. Unlike the others, this is a smaller diaper bag, but it makes up for it in cuteness. My Flat in London has great attention to detail. If you are like me, the bow on the front can complement your wardrobe, along with your little darling’s. Which diaper bag has you going ga-ga at the moment?